This is Part 1 of a 3-part series, Help Your Child Have a Ball in Sports, brought to you by AER, the first Automatic Ball Pump. In youth sports, there’s no magic formula for success. There’s no quick fix for acquiring perfect ball-handling skills and hand-eye coordination. It boils down to repetition and hard work, beyond just what happens in the game. You can help your child by practicing drills that improve peripheral vision, as well as his ability to react quickly and accurately to what he’s seeing. Have your child toss a tennis ball against a wall and practice catching it with one hand, and then the other. Your child can also do this with ah basketball or any ball. With the larger ball, the object is to progress to where your child can catch it with one hand and push it back using only his fingertips, then repeat using both hands. Racket sports are a great way to improve hand-eye coordination. Use any type of racket, such as a tennis racket or pingpong paddle, to do the following: Hold the racket and bounce a ball about 8 to 10 inches high 50 times without moving your feet or missing the ball. Playing ping pong with your child is another great way to improve hand-eye coordination. Teach your child to juggle with three beanbags or Hacky Sacks. This is a great way to train hand-eye coordination. Once he gets the hang of that, add some distractions to simulate real-life game-time situations. Have a radio on in the background, ask them questions they have to think about, just like game situations where they are surrounded by noise. Throw a basketball at your child from all different angles. Have him catch it no matter where the ball is…at his feet or to the side of his head. Dancing may not directly work on ball-handling skills, but it is another way to improve coordination and agility. This has led players and coaches to experiment with ballet and other dances as a conditioning method. Superbowl winner and former top high-hurdler Willie Gault was one such player who believed his on-field performance and resistance to injury was enhanced by ballet. Ballet has in fact been used within American football since the 1970s. The best way to improve coordination is through experiencing different sports and activities. Don’t limit your child to one sport, one type of ball. All types of activities–from ping pong to gymnastics to ballet–will help your child develop ball handling and hand-eye coordination in any game he chooses to play. For sport specific drills, here’s some ideas if your child asks for help outside of practice. This post is sponsored by AER, the first Automatic Ball Pump that gives you the perfect pump every time. 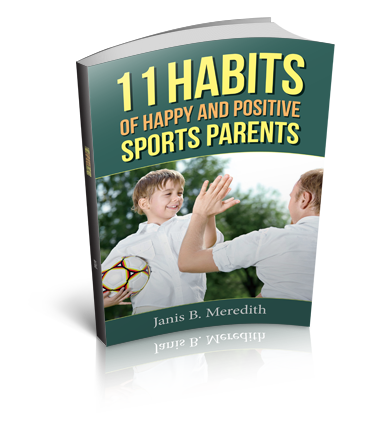 They want to help you and your child “have a ball” in youth sports!